To do this use the water bath method. Empty the can into a heatproof glass bowl and place onto a saucepan of shimmering water. It is important to check that the water isn’t touching the bottom of the glass bowl, and also that the water hasn’t evaporated. Stirring frequently, let it cook for 3-3.5 hours until it reaches the consistency of caramel and is a golden colour. While your condensed milk is cooking, on another water bath mix the butter and honey. Add the baking powder and heat for 1 minute on the water bath. Take off the heat, add the eggs and mix quickly before the eggs set. Sift in the flour and mix. The batter should end up being very thick and dough-like. Do not use an electric mixer, it is better to mix with a wooden spoon, and finish the mixing with your hands as though you are kneading bread. Put the bowl with the batter into the fridge for about 30 minutes. Once it comes out, the batter should be dough-like. Divide the dough mixture into 9 equal parts (weighing roughly 70g each). Place 1 dough ball onto a piece of baking paper dusted with flour and roll out as thin as possible. Cut out a circle using a giant biscuit cutter or a round baking tin (mine is 22cm in diameter). Pierce the circle with a fork several times. Repeat for all dough balls. Bake each giant biscuit in the oven for 3-4 minutes each until golden. Make sure to cool the biscuits flat, and don’t discard the cut off bits from the edges, you will need them later. Make the buttercream filling: using a mixer, make the butter fluffy. Slowly add the cooked condensed milk and honey. Put to one side. Crush the leftover edges from the biscuits. Crush the walnuts separably. Mix most of the crushed walnuts with the crushed biscuits, leaving a little bit for decorating the top later. Put the cake together by layering biscuit, buttercream filling, biscuit and walnut crumbs. Cover the top and sides with remaining buttercream, then use any leftover biscuit and walnut crumbs to cover the sides. 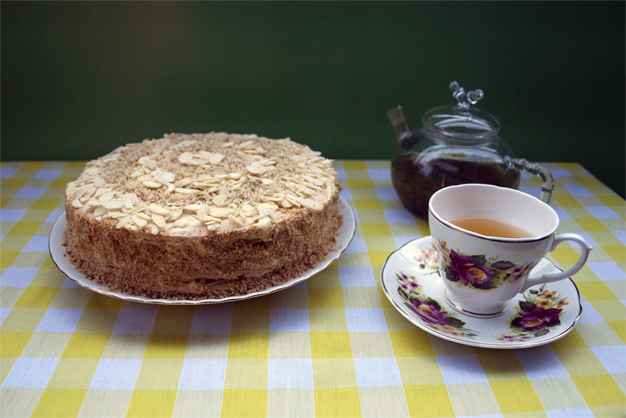 Using the flaked almonds and crushed walnuts decorate the top of the cake. You can also use decorations such as chocolate buttons and rainbow sprinkles to give it a fun twist. Leave in the fridge overnight to let the cream set and enjoy the next day with an unsweetened cup of tea.